Hello, everyone! 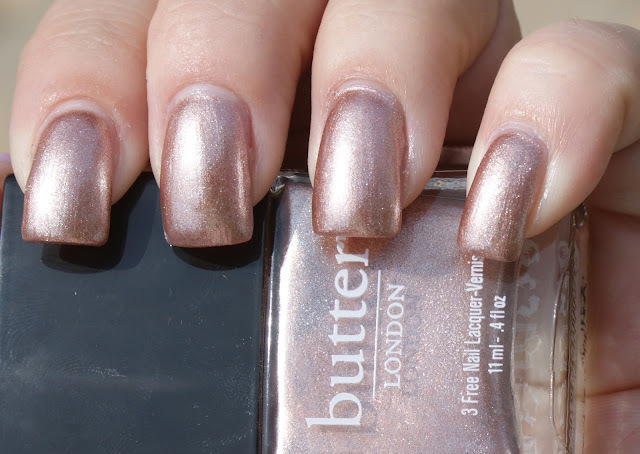 Today, I have for you two shades from the butter LONDON Summer Holiday Collection: Champers and Poole! Champers is a beautiful rose gold shimmer polish. Champers is British slang for Champagne... and this is certainly a bubbly color! It was opaque in two coats and applied like, well, butter! Poole is a robin's egg blue creme that reminds me of my favorite cotton candy ices! The photo is with three coats, though unfortunately, it was a little on the streaky side. But it wasn't too hard to work with. Overall, I liked the two shades from this collection. These didn't scream summer to me. But I'll definitely be rocking these in the fall! They are both beautiful, but Champers would have to be my favorite! Perfect for fall! They both look very good on you, a little too light for me, but they are pretty colors. Love! They would look really good together. I love this duo. I would definitely pick up Poole if it wasn't so pricey. I have Poole and I love it so! Kind of think I Need Champers now too! Ever since Poole came out I've been eyeing it. Maybe one day I'll give in a buy it, it's such a beautiful blue. I'm on the search for the perfect Tiffany blue - For Audrey and Dianna by Julep turn out more green - and I'm hoping Poole might be it. Beautiful swatches. Well, they're pretty, but I think I have much cheaper dupes. Sephora by OPI's Chestnuts for You = Champers and Salon Perfect's Robin's Egg for Poole (although SPs might be a bit more green). Love poole, what a perfect springy blue, I need this in a holo!